Lac Qui Parle Lake Fishing League kicked off the 2013 season last night. It was a tough bite with only 6 fish brought to the scales. We were greeted with rain, wind and cold. Josh Weckwerth and Justin Stone took first place honors and biggest fish for the night with a 6lb 4 oz walleye. Jack Anderson and Corey Reiffenberger took second with 2 fish weighing 2lbs 10 oz, in third place was Eric Spray and Adam Spray with 1 fish for 1lb 7 oz, in fourth place was Rick and Brennen Longnecker with 1 fish weighing 1 pound and rounding out the top five was Steve Dahle and Jamie Jahn with 1 fish weighing 14 oz. The second week of league proved to be better than the first. Although only 19 fish came to the scale the total weight for the night was 45.25 pounds, so almost a 2.5 pound average. Kelvin Weber and Jerry Ruth took first place honors weighing in a 5 fish basket tipping the scales at 16.25 pounds. Second place went to Josh Weckwerth and Dustin Stone with 10.38 pounds, they also won big fish honors for the second week in a row with a 5.8 pounder. There was a tie for third place, Brent Zupan and Tom Ludvigson, along with Jeff Randal and Scott Winson, both teams weighed in 5.1 pounds. Rounding out the top 5 was Stephen and Mickey Erickson with a 3.2 pound basket. The third week of the Lac Qui Parle Lake Fishing League showed that the lake is starting to turn on. Teams were greeted once again with overcast skies and strong south winds. Although water temps are still in the low 60’s, 38 walleyes were brought to the scale. Dave Cornelius and Mike Montag weighed in a 5 fish basket weighing 13.69 pounds to claim first place. Jerry Ruth and Kelvin Weber put together another nice basket finishing second with 13.13 pounds and also earned big fish honors with a 7 pound 4 oz fish. Third place went to Eric and Adam Spray who had a weight of 11.06 pounds. In fourth place was Cory and Jerry Heinrich who weighed in 8.56 pounds. Rounding out the top 5 were Steve Dahle and Jamie Jahn who weighed 6.13 pounds. Josh Weckwerth and Dustin Stone put together another nice basket weighing in 3 fish for 11 lbs 6 oz and earned big fish for the third time in four weeks with a 4 lb 11 oz walleye. Second place went to Eric and Adam Spray, who weighed 5 fish for 11 lbs 1 oz. Third place was Brent Zupan and Tom Ludvigson with 10 lbs. Fourth place went to Corey and Pat Joyce who weighed 4 fish for 7 lbs 11 oz. Rounding out the top 5 was Pete McGinty and Dallas Croatt with a 2 fish weight of 7lbs. place between Stephen/Mickey Erickson and Jeff Randall/Scott Winson, both teams weighed in 4.08 pounds. There were 45 walleyes caught including a 6 lb. 11 oz and a couple of 5 pounders as well. Jack Anderson and Corey Reiffenberger brought 15.02 pounds to the scale to capture the first place prize for the night. Jeri Ruth and Kelvin Weber continue to put together nice baskets of fish and weighed in 13.09 pounds for second place. Rick and Brennen Longnecker had a good night placing third with 10.08 pounds. Brent Zupan and Tom Ludvigson brought 8.02 pounds to the scale for a fourth place finish. Rounding out the top 5 was Josh Weckwerth and Dustin Stone who weighed 7.15 pounds. Eric and Adam Spray had the big fish of the night which was 6 lbs 11 oz. Jeri Ruth and Kelvin Weber continued to dominate the field weighing in a 12.11 pound basket which also included a tie for the big fish which was a 5 lb 14 oz walleye. Placing second was Rick and Brennen Longnecker who brought 11.09 pounds to the scale, including another 5 lb 14 oz walleye. Josh Weckwerth and Dustin Stone placed third with 8.04 pounds. Fourth place went to Steve Dahle and Jamie Jahn who weighed in 8.0 pounds. Fifth place went to Brent Zupan and Dean Broin who weighed 5 fish for 7.05 pounds. There were 34 walleyes weighed in. Next week is the last week of fishing league. For the current standings click on the results link at the bottom of this page. Dave Cornelius and Mike Montage won the final night of league with a 9.07 pound basket, which also included the big fish of then night which was a 4 lb 3 oz walleye. Jerry Kaupang and Gerald Clausen finished in second place with 6.14 pounds. Chad Strei and Brian Devorak took third place with 3.07 pounds. Pete McGinty and Dallas Croatt took fourth place with 1.02 pounds and Zach and Trent Jorgenson rounded out the top five. It was a tough bite with only 11 walleyes brought to the scale. The 2013 fishing league ended just like it started with very few fish being caught. There were a total of 215 walleyes brought to the scale over the 8 week league. Jeri Ruth and Kelvin Weber won the league for the second straight year with an impressive total weight of 69.88 lbs. This was accomplished even having a zero on week #1 and #8. Josh Weckwerth and Dustin Stone placed second with 47.12 pounds. 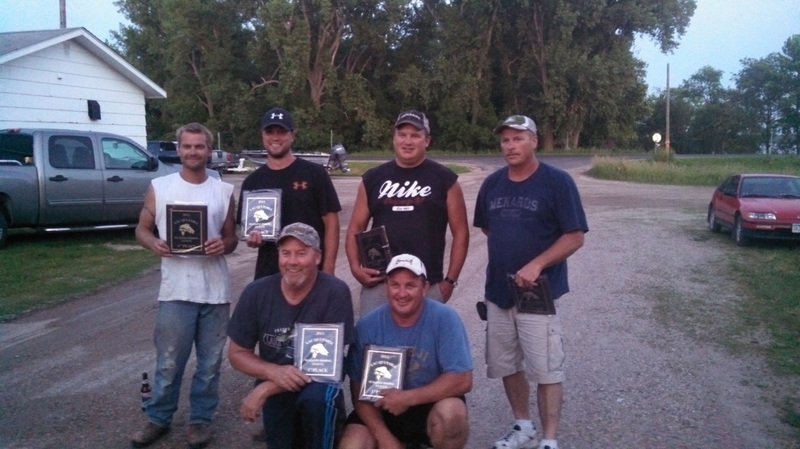 The league newcomers claimed the big fish prize 3 out of the 8 weeks. Brent Zupan and Tom Ludvigson took third place honors with 42 lbs. The two consistently catch fish pulling cranks. The Consistency Award went to Jack Anderson and Corey Reiffenberger. They are the only team to catch fish each week of the 8 week league. They ended up in fifth place with 35 lbs. Weekly Big Fish Prize was sponsored by Montevideo Co-op Credit Union and the Consistency Award was sponsored by Gold Leaf Financial. For a complete list of results click on the results link at the bottom of the page.